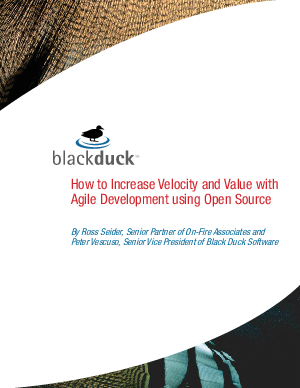 "Agile" software development is an increasingly popular development process for producing software in a flexible and iterative manner that can deliver value to the enterprise faster, reduce project risk and allow adaptation to changes more quickly. Open source software components have characteristics that afford their use in agile processes because they are modular, component oriented and standards-based. While open source software has enormous potential to be used in new projects so enterprise developers can avoid wasting time reinventing the wheel-there are hundreds of thousands of components available for reuse on the Internet-open source must be managed properly according to corporate policies and procedures.